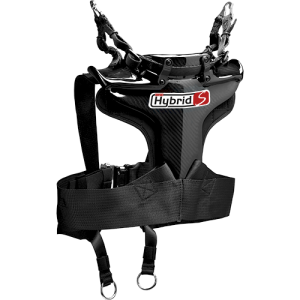 The Hybrid S Head Restraint is FIA and SFI approved (when worn with a multi-point harness system) and is tested and shown to be compatible with 3-point harnesses used by Car Club enthusiasts and High Performance Driving Experiences. This allows Driving Instructors, Auto Manufacturing Test Engineers, and other cars with 3-point harnesses to have added protection. We are pleased to offer protection to this sector of the market, however, Simpson’s top concern is your safety. While on a racetrack for the BEST protection we suggest a Full-Containment Cockpit System that includes a, Full Containment Seat, Snell rated Helmet, FIA or SFI approved Head Restraint, and 7 point seatbelt harness system.